John Haley "Zoot" Sims (October 29, 1925 - March 23, 1985) was an American jazz saxophonist. He was born in Inglewood, California. Sims' family was involved in vaudeville, and, for his part, John learned to play both drums and clarinet at an early age. Zoot's father was a vaudeville hoofer, and Zoot prided himself on remembering many of the steps his father taught him. Following in the footsteps of Lester Young, Sims developed into an innovative tenor saxophonist. He was born in Inglewood, California. Sims' family was involved in vaudeville, and, for his part, John learned to play both drums and clarinet at an early age. Zoot's father was a vaudeville hoofer, and Zoot prided himself on remembering many of the steps his father taught him. Following in the footsteps of Lester Young, Sims developed into an innovative tenor saxophonist. Throughout his career, he played with renowned bands, including Benny Goodman, Artie Shaw, Woody Herman, Stan Kenton, and Buddy Rich. He was known among his peers as one of the strongest swingers in the field. Sims frequently led his own combos and sometimes toured with his friend Gerry Mulligan with Gerry's sextet, and later with his Concert Jazz Band. Zoot had a long, successful partnership as co-leader of a quintet with Al Cohn, which recorded under "Al and Zoot". That group was a favorite at the New York club "The Half Note." Late in his career, Sims added the soprano saxophone to his performances. Sims' nickname ? Zoot ? was acquired early in his career while he was on the Kenny Baker band in California. The name was later appropriated for a sax-playing Muppet. 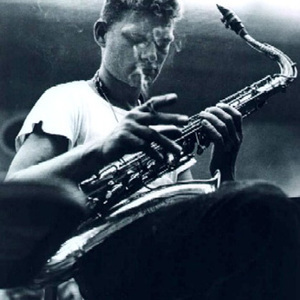 Zoot Sims died in New York on March 23, 1985.